Continued weak external demand and uncertain recovery of investments will allow for only modest growth prospects for the countries of Central, East and Southeast Europe (CESEE) this year. Slovenia, Croatia and the Czech Republic will remain in recession. Russia, Ukraine and the Baltic countries will experience a slowdown of growth. Over the next two years, growth will speed up, but will remain below potential for most CESEE countries except Kazakhstan and likely Turkey. The emerging institutional and policy framework in the EU that reflects unresolved dilemmas about the process of deepening may put in question the model of convergence growth. Widening of the EU is, in contrast, proceeding with Croatia acceding and the intention to start negotiations with Serbia being announced. However, given the worsening labour markets, social and political risks may be on the rise. These are the main results of the newly released medium-term growth forecast for the region by the Vienna Institute for International Economic Studies (wiiw). wiiw expects slow recovery this year within a mostly restrictive policy framework. Some acceleration, due in part to an improved external environment for EU and CESEE economies and in part to growth of investments, is forecast for the medium term. However, the set of better performers has shrunk, with Poland’s and Slovakia’s performance coming more in line with the growing number of slowly recovering economies. Recovery is slowing down in the Baltic region. There are still some countries that are struggling with recession, such as Slovenia and Croatia and also the Czech Republic within the CESEE group. Stability issues are also still being faced in a number of Balkan countries, e.g. Serbia, Montenegro, and Bosnia and Herzegovina; by contrast, Albania and Kosovo are managing to stay out of recession and on a relatively elevated growth path. Russia and Ukraine are seeing either a slowdown of growth or prospects for stagnation and slow recovery, while positive news keep coming from Kazakhstan and faster growth resuming in Turkey. 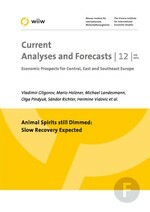 By and large, Central European countries are relying on a positive contribution from net exports and investments, the Balkan countries on recovery of industrial production and exports, Russia and Ukraine, and perhaps also Turkey, rely on a continued positive contribution of household consumption, and Kazakhstan on receipts from sales of oil and gas. None of these factors is particularly strong – hence weak GDP growth expectations prevail. Last but not least, the contribution of public consumption and investments tends to be rather limited throughout the whole of Europe. Monetary policy has been stabilising due to the assertive communication rather than action by the European Central Bank (ECB) and due to mostly relaxing actions by the other central banks in CESEE. However, these have affected recovery to a lesser extent because of the continuing process of consolidation in the financial sector. While sovereigns have seen a decline in the spreads of their yields, a similar calming down of interest rates in the private sector has been insufficient to support stronger credit activity, especially when it comes to small and medium-sized enterprises. This can be expected to continue to be a drag on growth of investments and thus also on overall GDP growth. Within the institutional and policy framework geared towards elimination of external and internal macroeconomic imbalances, the bulk of the structural adjustment is happening in the labour markets. Employment rates have declined in most countries while unemployment in particular among the youth and the long-term unemployed is on the rise. This is particularly damaging in the Balkans where the labour markets have been in depression even before the eruption of the crisis. There are few if any indications of a turnaround in the labour markets in the medium term. The strengthened emphasis on the correction of imbalances, reflected in the Macroeconomic Imbalance Procedure of the EU, may turn out to be harmful for the countries benefiting from EU transfers due to increased stress on using these funds as a disciplining device. In addition to fiscal imbalances, which should prove less of a problem to many CESEE countries, the correction of external and labour market imbalances may turn out to be more difficult to address. Moreover, balanced growth, implying less reliance on cross-border financing, may be a problem for countries that cannot move to a new growth model by mobilising more domestic savings. The processes of deepening and widening of the EU are proceeding, with deepening being more at a project- and institution-building stage while widening is getting a new boost by the accession of Croatia and by the start of accession negotiations with Serbia early next year. Croatia’s accession to the common market also means its departure from the regional free trade area, the CEFTA. Estimates of trade and welfare effects point to relatively mild overall negative consequences for Croatia in the short run. Those should be outweighed by more general positive effects of EU membership in the medium and long run. In a nutshell: the CESEE region faces a slow recovery in the short and medium term with unclear prospects for long-run growth and economic convergence. Makroökonomische Konditionalität im mehrjährigen Finanzrahmen 2014-2020: EU-Transfers für Netto-Empfängerländer in Gefahr?